This is truly a time honored favorite, no matter what name it has. Everyone love, love, loves this tender muffin with a crunchy spicy coating. Time honored because I first made it in college. I was a member of a women’s housing co-op where we shared the household duties in exchange for reduced housing costs. Work was set up on a two week rotating basis and included a stint as assistant cook and then chief cook. The chief cook planned the meals and could include anything she wanted as long as it was within the budget and reasonably nutritious. Except! 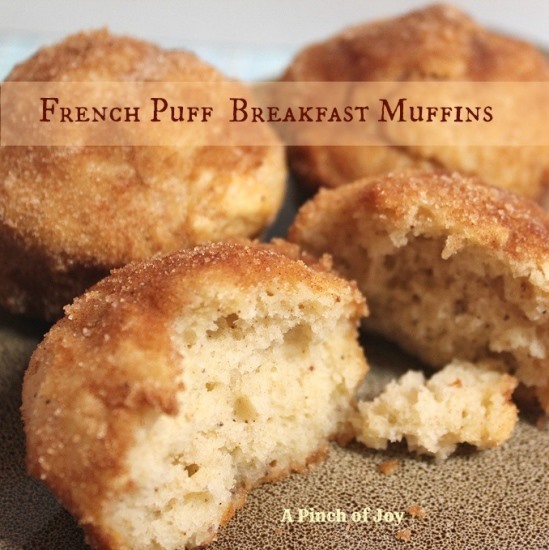 French Breakfast Puffs. It was house tradition that each head cook had to have French Puffs for one breakfast during her two week command of the kitchen. Everyone checked the menu to see when the Puffs were slated and no one missed that breakfast. Some cooks would serve it with a double or triple batch and nothing else but a serving of fruit. Others would make it a side for a more elaborate breakfast. Either way the muffins were always the star! Remember that muffin batter is a tender batter and should have as little mixing as possible. Stir until all ingredients are just mixed. Too much stirring and you will have tough muffins. Treat with tenderness and your love will show great returns – now there’s a post in a whole different direction! Mixing butter evenly into muffin batter is a challenge, so it works best to cut it into the dry ingredients before adding the liquids or to melt it and add it with the liquids. 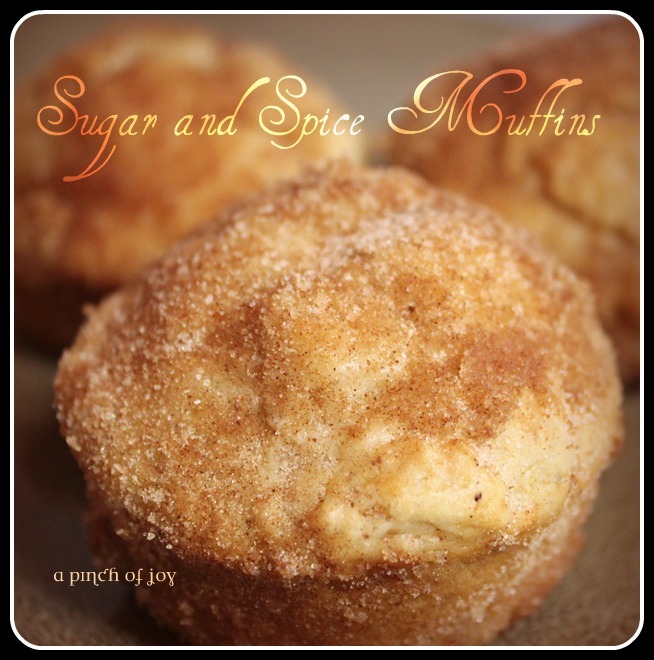 Have your cinnamon sugar mixed and the butter melted while the muffins are baking. I roll the whole muffin in butter and then cinnamon sugar according to house tradition, but you can just coat the muffin top. You can freeze the muffins and thaw at room temperature the night before or a few seconds in the microwave while gathering your “gone for the day” things. But for a real treat, schedule them when you have time to enjoy them with good friends and family. Quick and easy, THE best ever, breakfast muffin baked to gold perfection, drenched in butter and covered with cinnamon sugar crunch. Spray or grease 12 cup muffin pan. Combine biscuit mix, ¼ cup sugar, and nutmeg. Cut in 2 tablespoons of butter with fork or pastry cutter. Add milk and egg; mix until all ingredients are just combined. Batter will be lumpy. Bake at 375 degrees for 15 minutes or until golden. Melt butter and mix topping while muffins bake. Remove muffins from oven when done and immediately roll in melted butter and then cinnamon sugar. Absolutely THE best breakfast muffins, baked to perfection, dipped in butter and rolled in cinnamon sugar! In medium bowl, mix dry ingredients well. Thoroughly combine milk, egg and ¼ cup melted butter in a small bowl. Add liquid to dry ingredients stirring just until all are mixed. Batter will have lumps. Fill muffins cups just under ⅔ full. You may not use all 12 cups, depending on size. Bake at 375 degrees for 15 minutes until toothpick inserted into middle comes out dry and muffins are turning golden. While muffins are baking, melt ½ cup butter in microwave. Mix sugar and spices in small bowl.. When muffins are done, remove from pan to cooling rack and immediately roll muffins in butter and then sugar spice mix.